Tired of your old couch color? Leather can be dyed, restored or oiled to a darker color with some TLC. 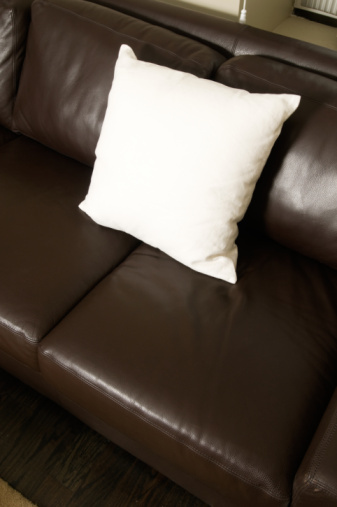 Leather couches show signs of wear and tear over time, and too much exposure to sunlight can cause fading. Absorbent leather couches are treatable and can be slightly darkened with natural oils, or drastically changed with leather dye. For a completely new color use leather dye. Applying leather dye can create a different color, and brighten your décor while repairing old and faded spots. Chose a dye in your preferred color and clean your sofa with a leather cleaner. Use a sponge to apply the dye, using about a tablespoon at a time. The first coat you apply primes the leather, much like a primer is used for painting. The first coat shouldn't be too heavy, since this can cause cracks as the dye cures. (Some recommend drying coats with a hairdryer between coats to make sure the layers are evenly dried.) It's better to have many thin layers of leather dye than a few thick layers. Applying multiple layers will also allow you to control how dark the couch becomes. Wrinkles and discoloration in leather can be softened and restored with a leather recoloring balm. This is the best choice for a leather couch that might have faded in the sunlight or dried out in spots that see more wear. Balm works like lotion on skin. Rubbing it into the absorbent leather surface allows it to renovate the color. 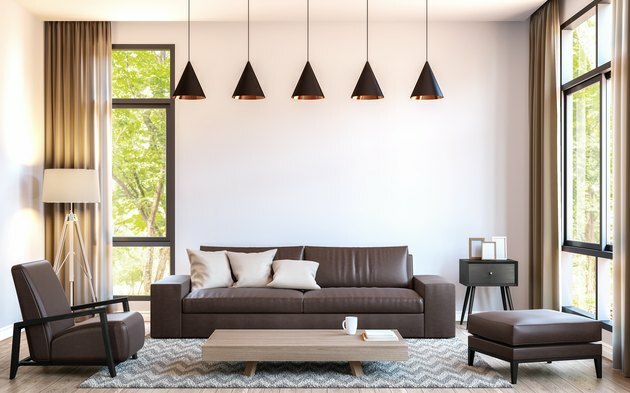 Pick a color that best matches your leather, or choose one shade darker to darken the whole couch. Clean the leather first, and let it dry completely before applying in a circular motion with a cloth or sponge. If you are unsure about the color matching, try a test patch on part of the couch that is not seen, like the underside of a cushion. Natural oils will safely coat the leather and work like a conditioner to become supple and soft. The oils will also darken your couch slightly, adding a richer tone to the conditioned leather. This is for a subtle darkening; dramatic color changes can only happen with leather dye. Leather-safe oils include neatsfoot oil, mink oil and vegetable oils like coconut or olive oil. These should be applied with a spray, and immediately smoothed over with a sponge or clean cloth to ensure that there are no uneven spots. Do not sit on the furniture until the oil dries, since your clothes can absorb the oil. The added benefit of a natural oil is that it helps prevent the leather from cracking.